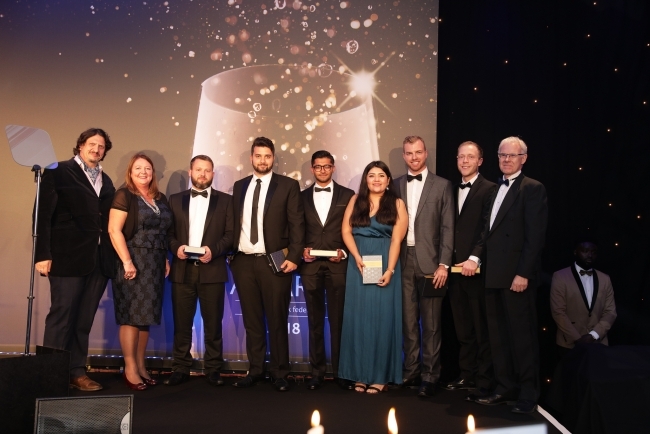 The Food and Drink Federation (FDF) Awards 2018, which took place last week at The Royal Lancaster, London, brought together over 500 guests to celebrate the food and drink manufacturing industry’s contribution to the UK. Jay Rayner, celebrity restaurant critic and food journalist for The Observer, hosted the event which was sponsored by headline partner Santander Corporate & Commercial. The evening also recognised the first graduates from the MEng Food Engineering degree at Sheffield Hallam University. Developed by the Food and Drink Federation, the National Skills Academy for Food and Drink, and Sheffield Hallam University, the course is the first accredited engineering degree at Master’s level entirely dedicated to the needs of the food and drink manufacturing industry. Sophie Paveling, Electrical and Mechanical Engineering Apprentice at Coca-Cola European Partners, has made a noticeable impact within the business, driven by her proactive attitude to taking on responsibility and new tasks to further develop her professional skill-set. The Birds Eye Relaunch 2017 focused on its core hero platforms such as Captain Birds Eye, Garden Peas, and Chicken and included brand investment, packaging redesign, product quality improvements, new campaigns, and a transformation of media support. Unilever’s Marmite Gene Project found that Marmite taste preference is genetic and created Gene Test Kits, launched by a campaign that reached 31% of UK adults within 24 hours. NEMI is a London-based tea company operating as a social enterprise offering a variety of loose whole leaf tea blends and a Chai Syrup, which provides employment to refugees to help them better integrate in the UK. apetito’s Mini Meals Extra product range was designed to offer a nutritious meal in a manageable portion size to individuals at risk of malnutrition, improving health and reducing food waste. Nestlé UK’s Nestlé Academy Campus Team Initiative involves their apprentices and graduates in designing, planning, and leading engagement activity with schools, colleges, and universities to help inspire the next generation of talent for their business and industry. Cocoa Life, Mondelēz International’s sustainable cocoa sourcing programme, is an industry-leading, independently verified programme that aims to support sustainable cocoa farming, securing a positive future for cocoa farmers, their families, and their communities. Premier Foods products can be found in 40 countries, with over 800 SKUs available internationally. One guiding principal has helped Premier Foods continue to deliver on its ambitious growth trajectory: it partners with local retailers, building long-lasting, insight driven relationships. Chris Quarmby, Control Systems Specialist at Lincoln Manufacturing, PepsiCo, has been involved with and led numerous successful projects, receiving praise and recognition for his work from colleagues and through various company-wide award schemes. Simon Flanagan, Research Principal at RSSL, leads the Food Safety and Quality Division and provides specialist advice on allergen risk assessment and management, the largest single cause of product recalls globally. ABP UK has made a strong commitment to act against the critical issue of modern slavery within the UK food processing industry with its Stop Modern Slavery campaign. Environmentally-friendly secondary packaging company TrakRap designs and creates 100% recyclable packaging solutions for the food and drink industry in order to help minimise waste with The TrakRap Packaging System. Katherine Cook, Innovation Manager at Premier Foods, has a strategic, consumer-centric, and collaborative approach which has led to the agile development of three long-term innovation pipelines. She has also taken on a range of ambassadorial roles to inspire future talent. STICKSOLOGY’s tea infuser sticks have won innovation awards and their unusual business strategy has seen them set up a branch office in Shanghai and help other UK brands to enter the Chinese market. Independent ingredients manufacturer Macphie has developed a product range with 30% less sugar, measured against its current standard products, while keeping the same high quality and great taste. A silent auction at the event also raised £4,815 for industry benevolent charity GroceryAid. Companies who generously donated prizes include: Alps Group, Britvic, The British Museum, Cargill, The Conference People, Fudge Kitchen, Haribo, Hilton Park Lane, Macquarie, Mondelēz International, Nestlé, Pladis, Premier Foods, Royal Haskoning DHV, Santander Corporate & Commercial, SLR Consulting, SMC Pneumatics UK Ltd, Tunnocks, and Unilever. Ian Wright CBE, Chief Executive, Food and Drink Federation, said: “Warm congratulations to each of the winners of FDF Awards. Our wonderful dynamic industry dictates that every category is closely fought. So, while winning is a significant achievement, every entrant should be proud of their contribution to UK food and drink. We are also hugely grateful to Santander Corporate & Commercial – our headline partner – and to all of our Award sponsors. I also thank all those who donated lots to our silent auction supporting GroceryAid and the bidders who take them home.